Stockholm is an interesting city. Like most cities in the world, it has a number of different neighbourhoods, each with its own character. I had been told not long after I moved here that most people tended to stay in their neighbourhood, on their island, literally. After having been here for more than two years now, I understand why this is happening. After all, why would anyone from Södermalm would go all the way to Östermalm or Sankt Eriksplan – or vice versa – to have a coffee when everything is available on each island, in each neighbourhood. And this is exactly why I started this blog. To get me out of my flat on Saturday mornings, as an excuse to get out of bed and do something, especially in the dark winter mornings. 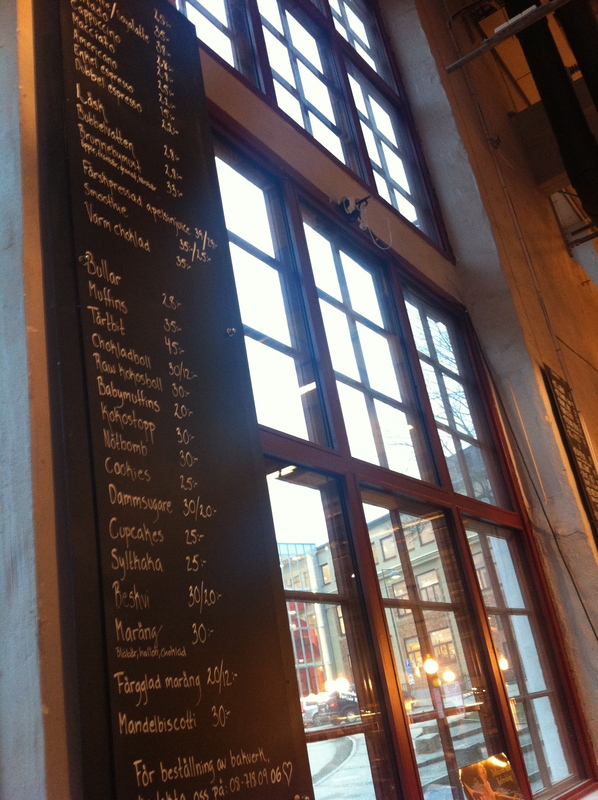 And thanks to this blog, I have seen many different parts of Stockholm. But like most real Stockholmers, I am making one big mistake: I rarely go to the suburbs. Sure, I have been to Fittja a couple of times to eat burek, or to Tensta to go to Livstycket. Or to Bagarmossen to see a friend. But not much more than that. Now, the concept of suburbs in Stockholm can be misleading. For example, it can take me about 30 minutes door-to-door to get to a place at Sankt Eriksplan but it will take me less than 15 minutes to get to Sickla in Nacka, where I never thought of going because it’s the suburbs! Until I finally went today! A few weeks ago, a good friend of mine who lives in Sickla showed me a photo of a café in Sickla where there were birds flying freely. When she made me realized that it only took a 7-minute bus ride from Slussen to get to Sickla, I quickly decided that I would soon visit this wonderful café with birds. And I did today at Dieselverkstaden! Café Voltaire is located in Dieselverkstaden, a former industrial building turned into a nice hipster hang out with a café, restaurant, the municipal (and private) library, a gym, a theatre hall, stages, a music studio, etc. And all this surrounded by the biggest shopping mall I have seen so far in Sweden. To be honest I am still a bit confused about Sickla. 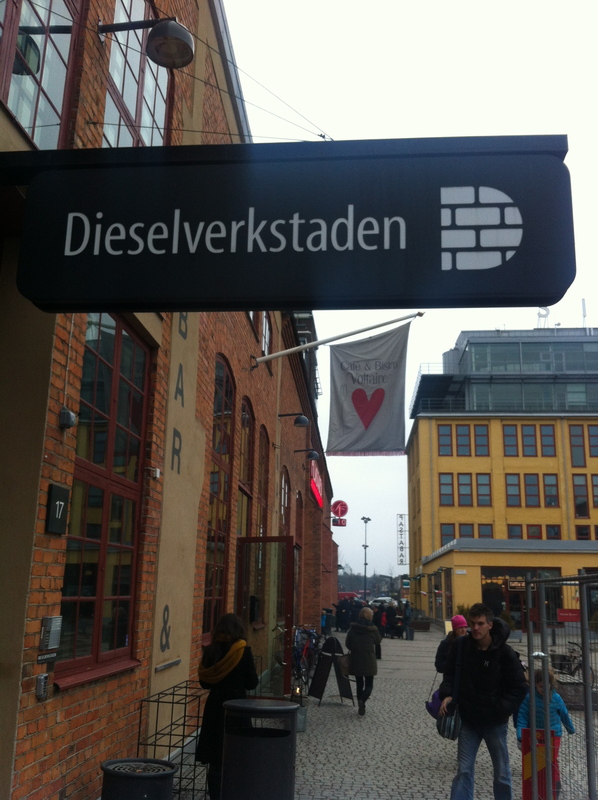 The Dieselverkstaden part reminds me of the Distillery District in Toronto or some of the cool areas in Vancouver. A few minutes from Dieselverkstaden is the Sickla lake, an oasis of peace which looks – and feels – a lot like some of the quietest islands in the Stockholm archipelago. And in the middle of all this are the shopping malls, which remind me of the ugliest suburbs of Montreal. All this a 7-minute bus ride from my flat! I fell in love with Café Voltaire as soon as I walked in. The high ceilings, the large windows, the open concept and the library as the natural extension of the café quickly convinced me that I would have a good time this afternoon. My impression were confirmed when I saw the large selections of cakes and pastries available at Café Voltaire. 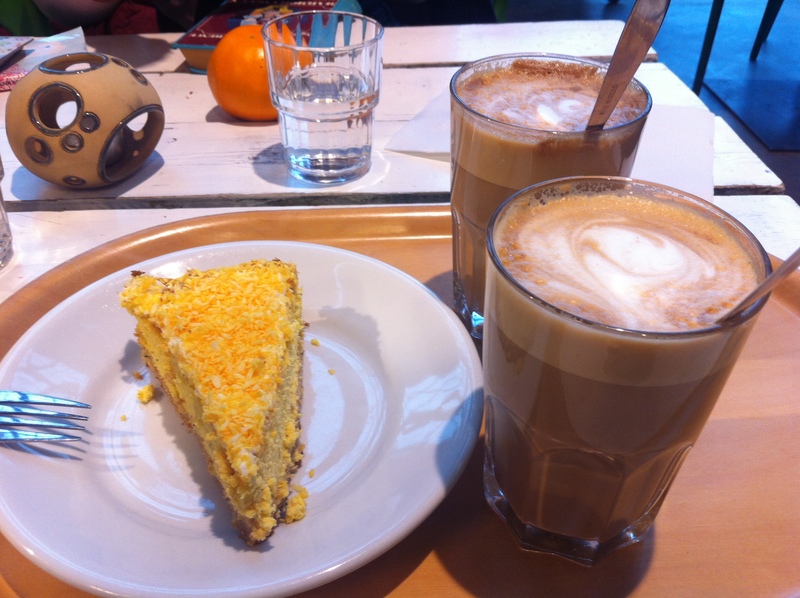 Now, pay attention to the yellowish or orangish cake you see next to the cashier on the photo above. After having spent some time looking at all the options and getting closer to the cashier where I would eventually have to make a decision, I saw the cake. A mango and cardamom cheesecake! I couldn’t resist! With a latté. My friend is much more reasonable than I am. She had a latté and an orange… But we won’t judge her. She is a nice person anyway! Café Voltaire must also be nice in the summer when tables are out in the sun. 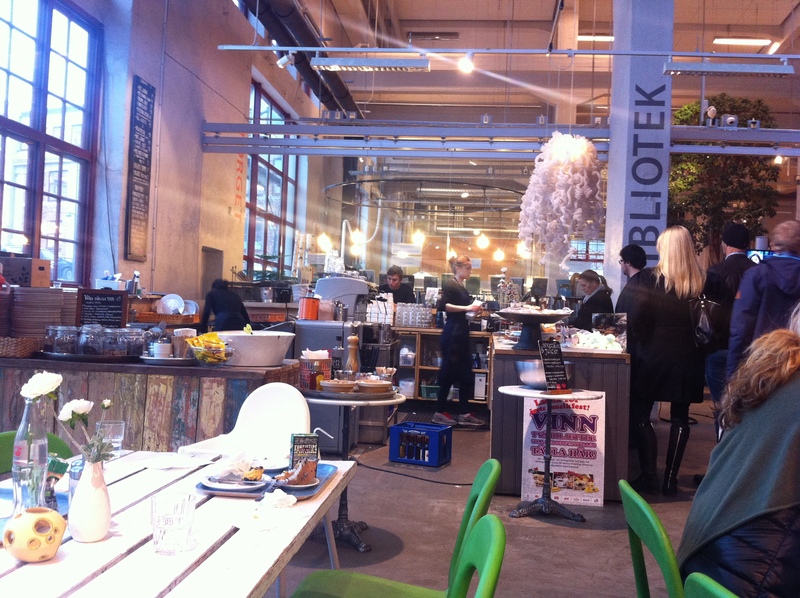 The Café is also attached to a Bistro – Bistro Voltaire. Not very original in terms of name, but the food looks delicious. Another good reason to go back to Sickla! Somehow, it almost fell like summer at Café Voltaire today. Maybe it has to do with all the light coming in. 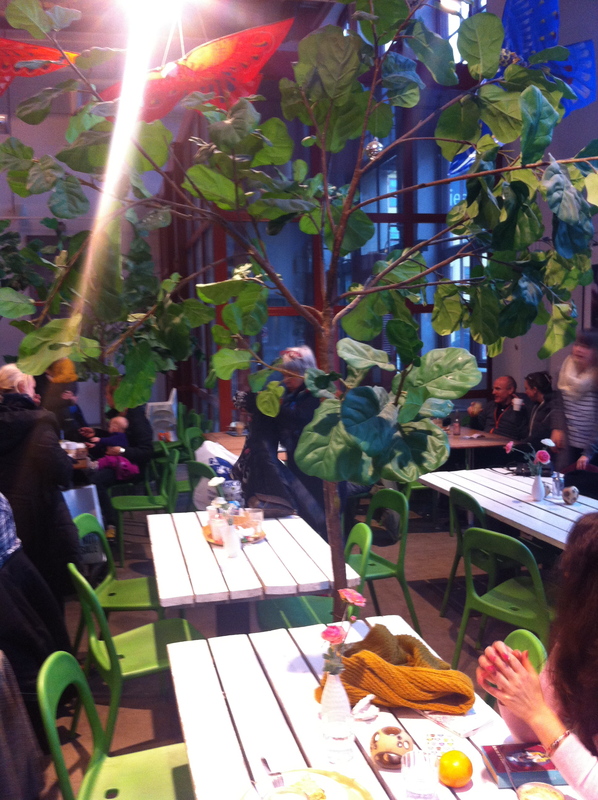 Or the nice plants every where in the café. Too bad there were no birds in the café today! My friend could see that I was a bit disappointed that I did not get to see any birds in the café today. So she went to the Dieselverkstaden information desk to ask about the birds. What we learned was, to say the least, unexpected! It turns out that Dieselverkstaden killed the birds! Yep, that’s right, they killed the birds! Apparently it went out of control and there were too many birds – they were all free birds “squatting” the building – which started to build nests in Dieselverkstaden. I can imagine that too many birds flying around could be a problem in many respects, including for food at the café, books in the library, etc. 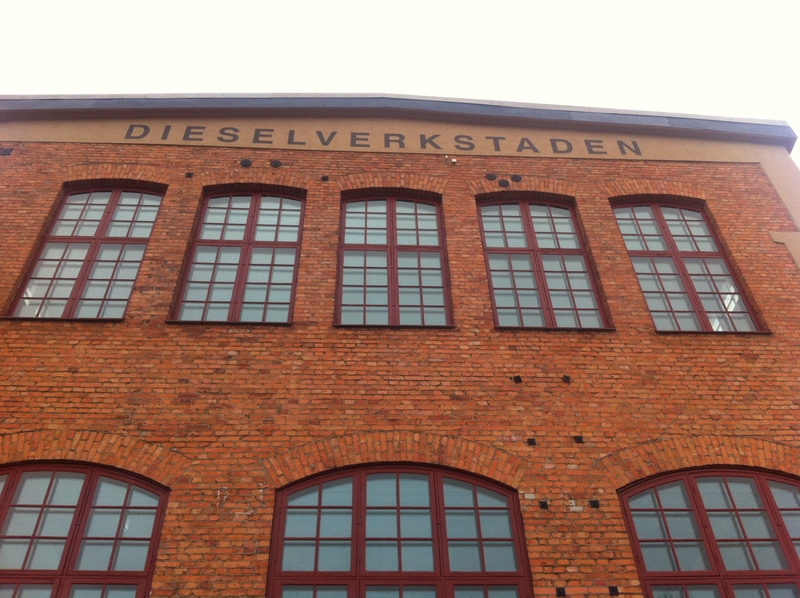 Hopefully Dieselverkstaden will now do a better job at not letting the birds in anymore so they don’t have to kill any in the future! Ok, let’s forget about the birds and let’s look at the menu. 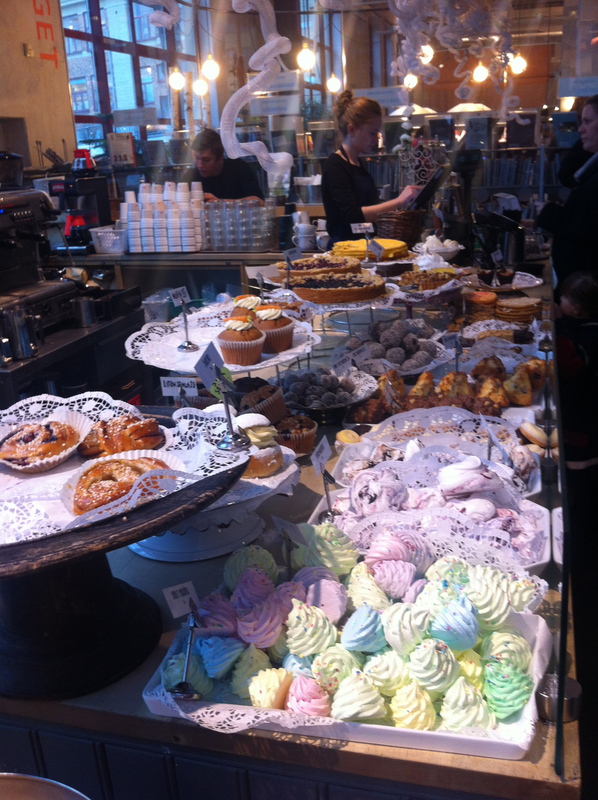 That should be sufficient to convince you to get on a bus and go to Sickla for a nice fika at Café Voltaire. I know, the New York – Montreal is my favorite one! And here’s something that has great potential for making me fall in love, and go back to blogging! You should ask Amtrak to do this on a route that goes to Canada. There is one going to Montreal, and another to Vancouver!